Brrr, it's cold outside! Children know how to roll snowballs and build snowmen, but dressing themselves for the cold is another story! 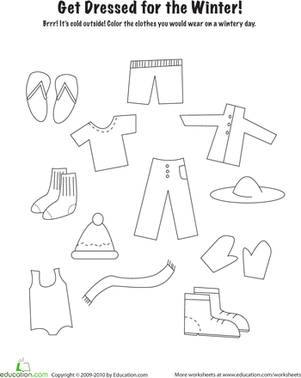 On this winter clothes coloring page, your child will colour the clothing items that are appropriate for a cold winter day. This is a fun exercise that will help your child learn about dressing appropriately for the season. Welcome to the winter wonderland! Celebrate the spirit of Christmas with these jolly woodland animal friends. 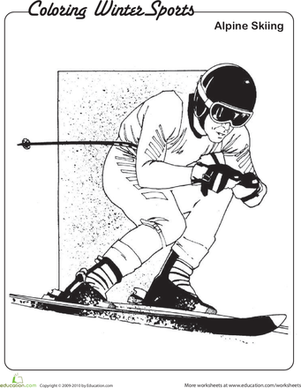 Occupy your kindergartener over winter break with this charming coloring page featuring an alpine skier. Help your kid get into the festive spirit with this holiday bells coloring page, perfect for cozy, winter nights. If your child isn't ready yet for snowboarding, or if he just can't wait for winter, tide him over with this extreme snowboarding coloring page. Give him this cute coloring page! 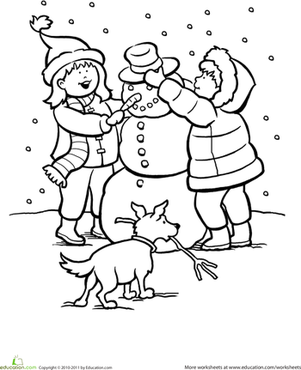 It features two children making their own snowman in the midst of a winter snow. 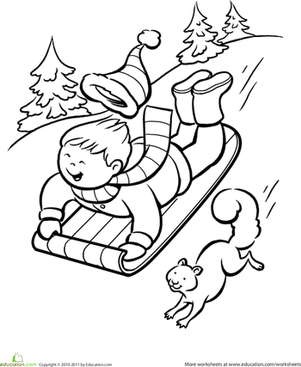 Get your kindergartener excited about winter with this sporty, charming skiing printable! 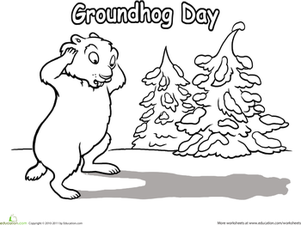 Get silly with this wacky winter coloring page. Can your little artist tell a story to go with the picture as he colors it?